Italy is one of the founding countries of the Eurovision Song Contest. The original idea of bringing songs from different countries into one show with a winning song which should be the “Song for Europe” for the respective year is taken from the San Remo Festival. In most cases the winner of the San Remo festival or a participant has been chosen to represent Italy at the ESC. In this year’s 63rd edition of the San Remo Festival the winner of the contest has also been announced by RAI as the Italian representative in Malmö - it’s Marco Mengoni with “L’Essenziale”. 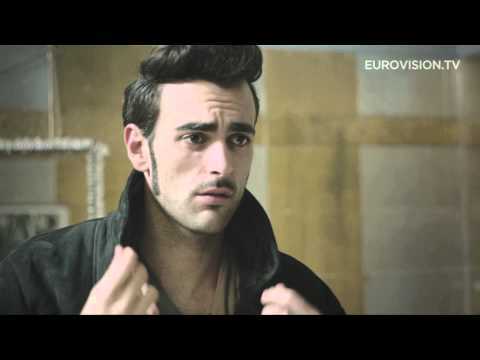 Marco Mengoni was born in 1988 in Ronciglione, province Lazio (middle Italy). He has taken singing lessons with 14 years and joined a vocal group. His music influences he mainly got from the Beatles, David Bowie, Michael Jackson and Renato Zero. Later on he studied industrial design languages and moved to Rome. Marco collected some valuable experiences in sound mixing and music programming. In 2009 he entered the Italian X Factor, where he was the winner. “Dove Si Vola” was his first hit, which reached a top position in the Italian download charts. Marco has already participated in the 2010 San Remo Festival for the first time and reached a respectable 3rd rank, with his second song “Rematto” he could even climb #1 in the Italian charts. The first studio album “Solo 2.0.” reached gold status and the latest album “#Prontacorrere” has just been released. Due to all his growing popularity he even reached an MTV award as “Best European Act” as first Italian. These are all good conditions for competing in the Eurovision Song Contest. The song “L’Essentiale” is a great ballad in the typical Italian style. The orchestral arrangement makes this song a pearl in this year’s competition. Marco’s voice has been described as soul based with British / Black influences and his voice is very suitable for live singing which is very important at the ESC. Marco has captured the Italians by a storm and so he will do with the Europeans. This is probably the strongest song for years and in Malmö he belongs to the top favourites! For Italy it’s the 40th anniversary in the Eurovision Song Contest this year! The original idea of the ESC resulted from the Italian music festival called “San Remo Festival” which started in 1951 for the first time and it’s still exciting and very popular. The concept came up to do a similar contest on an international level, which has become reality in 1956. Normally one of the winners of the San Remo festival will be the Italian representative for the ESC. In the ESC Italy has won twice “Non Ho L'étà” by Gigliola Cinquetti in 1964 and “Insieme: 1992” by Toto Cutugno in 1990. Over the years many of the Italian contributions became a hit all over Europe and are strongly connected with typical Italian music like “Per Lucia” by Riccardo Fogli in 1983 (11th), “Gente di Mare” by Umberto Tozzi & Raff in 1987 (3rd) and “Fiumi di Parole” by Jalisse in 1997 (4th). Furthermore there were many Top 10 rankings for Italy – 4 times 2ndand 4 times 3rd -, so it’s one of the most successful countries in Eurovision. Italy has paused for twelve years (1998 – 2010) until the Italian broadcaster RAI has decided to return in 2011, this has been appreciated very much internationally, as Italy is known for high quality songs. Luckily, Italy shaped up very well in Düsseldorf with “Follia D’Amore” by Raphael Gualazzi and came 2nd. One year later with “L’Amore E Femina” by Nina Zilli a 9th rank could be reached.